Hairdressing wasn’t Leonardo’s only challenge; while training to be a hairdresser, he was simultaneously studying a business and spanish degree at Queen mary’s university, London. “it was a four-year course and i fitted in my hairdressing training at weekends and free days, alongside my degree” explains Leonardo, clearly not shy of hard work and dedication. Blessed with a good ear for languages, Leonardo speaks fluent italian and spanish with french not far behind. it’s a gift much appreciated by the multiple international audiences Leonardo now presents to every year, as he speaks to them in their own tongue. “i worked for a year in barcelona, training alongside the famous spanish hairdresser, Luis Llongueras” says Leonardo. 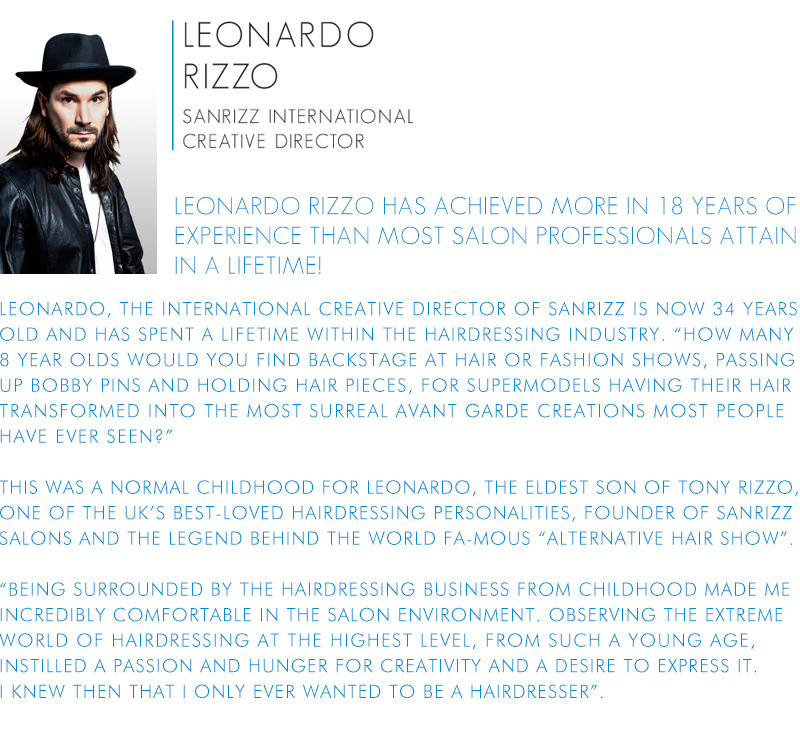 “ as well as perfecting my spanish, it gave me a fantastic insight to a very different way of working with hair.” after returning to the uk, working in the sanrizz covent garden salon for six months, 2003 saw Leonardo open the sanrizz salon in guildford, where he now works a few days a week, running a fully booked column and waiting list, as well as managing a team of young, talented stylists. He looks after his celebrity and media clients in the sanrizz flagship salon in knightsbridge and admits to precision cutting as his forte (proven by his ever-lengthening and very loyal client list). Leonardo also loves to let his creativity run riot with avant garde work and experimenting with hair colour – a passion that comes into its own when preparing models for the alternative hair show. his skill in this complex area of specialist work is confirmed by Leonardo being a two times finalist in the avant- garde category of the british hairdressing awards. “My role as a sanrizz global ambassador is to create the company’s brand image and drive awareness” he explains. “i’m responsible for all sanrizz imagery and international work. we hold photo shoots in London, hamburg and berlin plus present stage shows, seminars and hands-on teaching in china, the usa, across the whole of europe – italy, france, spain, belgium, holland and of course the UK. Leonardo is as real as you get! a busy salon stylist, creative talent with strong vision and at heart he is a family man who loves nothing more than spending time with people and sharing his genuine belief in making life fun and enjoying every second.